Nowadays you used to robots… They are everywhere, at the office, at home, on the streets. They change our life… For better. But do you remember what was the beginning? Was it so bright as now? 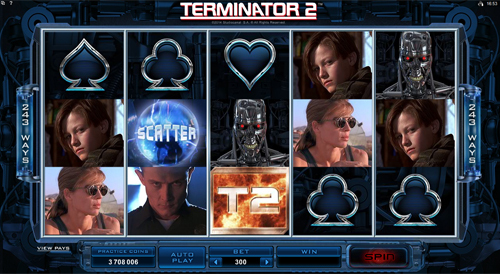 Terminator 2 Slots Machine is going to REVEAL THE TRUTH! Microgaming group offers you to back in time using the flash portal and meet DANGEROUS robots from the future of the past! Just launch the blockbuster 5 reel video game to turn into your favourite hero from the movie and DESTROY enemy robots in 243 Ways. You should better be made of hard metal, because the danger lies in wait for you everywhere here. Free Spins, T-800 Vision and smashing prizes like 880,000 coins can attack you at any moment… REEL WAR for your life of ease has already started! Besides 243 ways-to-win, here you have nice chances to survive and win big, because you have strong reinforcing team of wild and scatter. Yep. Each symbol can bring you not only a scoop, but the VICTORY! 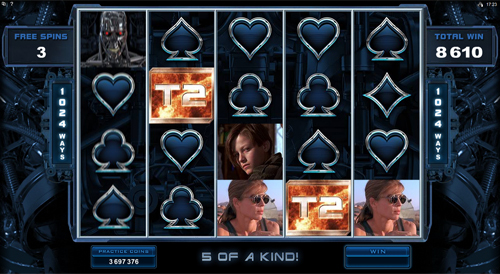 So that, T2 Logo is a wild that searches for symbols to replace and combos to complete. The Logo is the best icon to use in case you need a help in creating more winning combinations. Use it smart and long life with full pockets are promised. Orb is a scatter symbol. It can send not only new robots like Terminator to save the world, but also bring electrifying money prizes. And that’s all even without building combos. So, your task is to collect 2, 3, 4 or 5 scatters anywhere on the screen and you will win 1x, 2x, 10x or 100x Multiplier accordingly for your total bet! And if at least 3 scattered Orbs occur on the reels, then it’s too late to run… Because Free Spins is already here. It’s war. Reel war. Thus, you need to have some weapon to win it. Here you can find such coins $0.01, $0.02, $0.05, $0.10, $0.20, $0.25 or $0.50 to use against money prizes. Just suit yourself and pick the gauge of total stake you like by fixing up to 300 coins of definite value per spin. Are you ready to check out your steel? Then stake the highest possible stake of $150 per battle and try to win the ultimate prize of 15,000 coins. Eager to grab the top jackpot of $7,500? 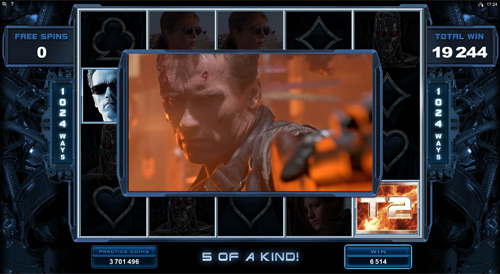 Then risk to play the max bet and manage to get the combo of 5 T2 Logos. Can you get over that? But if you like another kind of heroes, then just don’t miss out your chance to get superabilities playing The Dark Knight Rises. Your enemies never sleep. And even if the spin in the main game doesn’t bring you a win, it doesn’t mean that you will go away… Without prize. 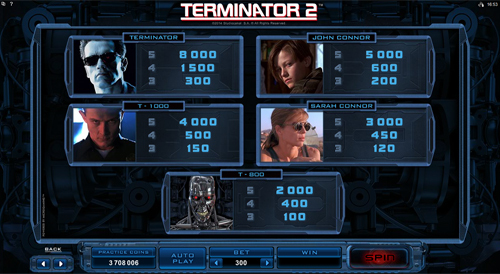 Just because MERCILESS T-800 Vision Feature can be triggered in such a case. Yeah! 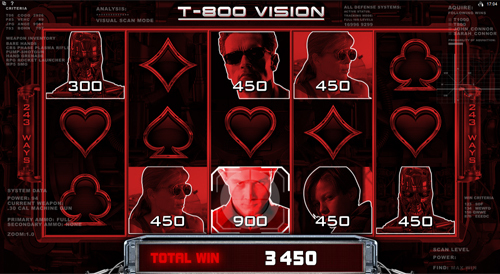 There is no corner to hide from awards… T-800 Vision is searching for symbols to turn them into coin win. And if there is at least one scatter, then there is nowhere to go, because Free Games battle is going to start… Prey and RUN! But the prize of 880,000 coins or $440,000 is weighty reason to do your best, isn’t it? Anywhere, do you remember that the evil doesn’t sleep. So, keep your eyes wide open within Free Games last to watch out T-100 that can transform into any other character to… Award you with extra prize! However, everything has the end… We hope you will have the happy one notwithstanding that you can’t re-trigger the feature. Anyway, the battle for the bright future and big cash win keeps going on!